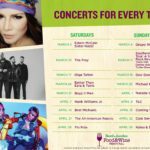 This weekend the Busch Gardens Food & Wine Festival begins and I just learned some more exciting news about their kickoff weekend! 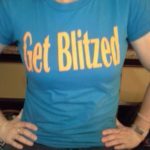 Check out the notice they just sent me below the image! 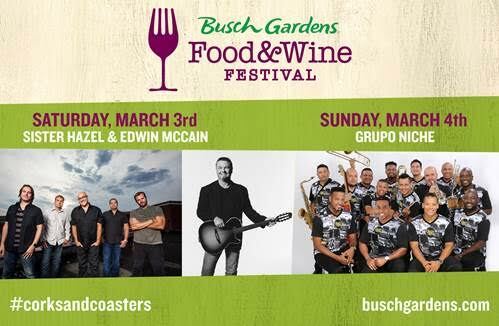 TAMPA, Fla. (Feb. 26, 2018) – Chart-topping artists Sister Hazel and Edwin McCain, and Latin sensation Grupo Niche will take the stage this weekend at Busch Gardens® Tampa Bay’s fourth annual Food & Wine Festival. 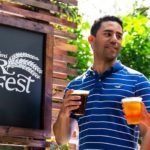 The festival takes place on Saturdays and Sundays March 3 through April 29. Concerts are included with any Pass, Fun Card or daily admission. Be the first to know about new events, special deals and future announcements by following the park’s blog at BuschGardens.com/tampa/blog, or “Like” the Busch Gardens Facebook page, and follow @buschgardens on Twitter, Instagram and Snapchat. 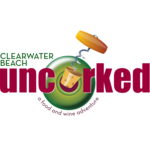 The company owns or licenses a portfolio of recognized brands including SeaWorld, Busch Gardens® and Sea Rescue®. 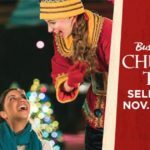 Over its more than 50-year history, the company has built a diversified portfolio of 12 destination and regional theme parks that are grouped in key markets across the United States. The company’s theme parks feature a diverse array of rides, shows and other attractions with broad demographic appeal which deliver memorable experiences and a strong value proposition for its guests. Visit AdventureIsland.com or Busch Gardens.com.